Since I started messing around with welding, I decided to start challenging myself with other materials than wood and paint. I'll be totally honest, refinishing wood furniture is getting too trendy for me. Almost any house wife can hit the thrift store, buy a can of paint, and voila, another lightly distressed, painted dresser. Don't get me wrong, by no means am I discouraging people from making something beautiful! I actually think its awesome! I love seeing ladies find their creative side and make a little money in the process. I just want to do something to stand out from the pack. Know what I mean? Plus, I love learning and I like a challenge. 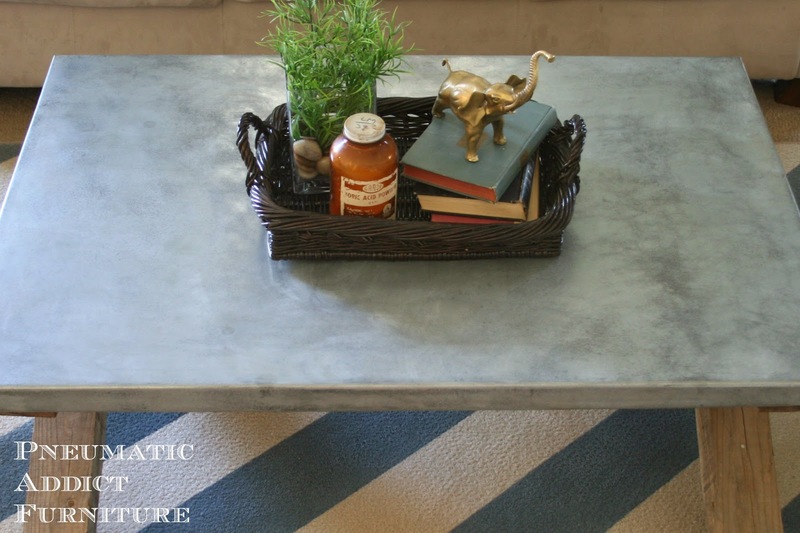 My first metal furniture project was my World Market Aiden Coffee Table Knock-off. Everyday I put my feet up on it and think "I can't believe I made this". I love it. Shortly after, I got this image in my head of metal topped coffee table with beefy, wood X's for legs. Imagine my surprise when looking and I found this Pottery Barn table. Not a dead ringer for my imaginary table, but pretty darn close. I didn't much care for the beam running through the middle. Good thing its not necessary. I dug through my hoard stash and came up with this solid pine table top. The legs were amputated for the sake of my industrial farmhouse table months ago. 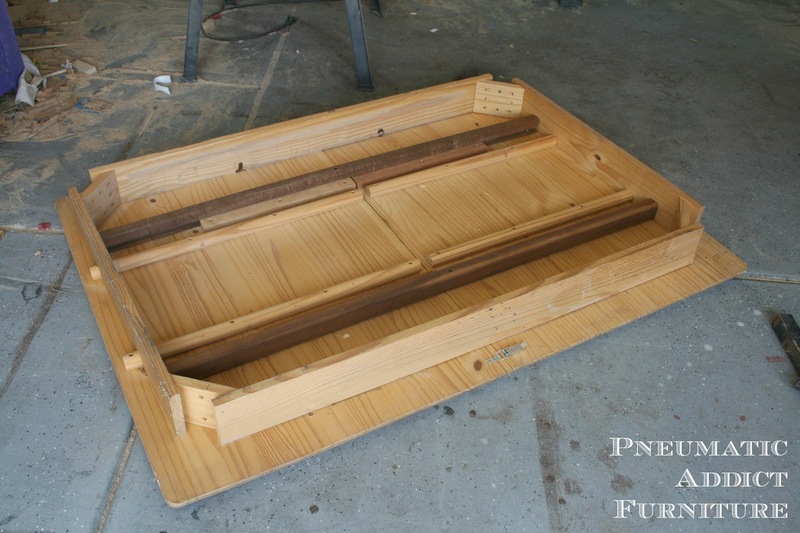 The first step was to remove the aprons and leaf sides, leaving just the wood top. 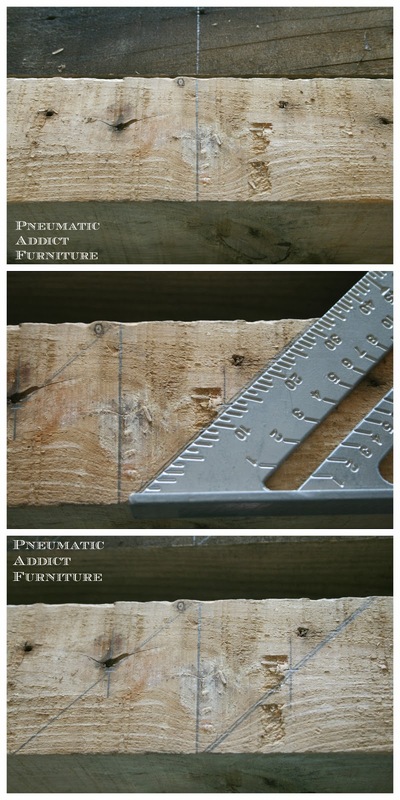 If you didn't want to use an old table top, you could easily have a piece of plywood cut to size at the hardware store for you and use that (if you're really nice and show some cleavage they usually don't charge you to cut it ). This thing was huge enough, that I only ended up needing one half of the top. The next task was to cut off the routed edge with my table saw. 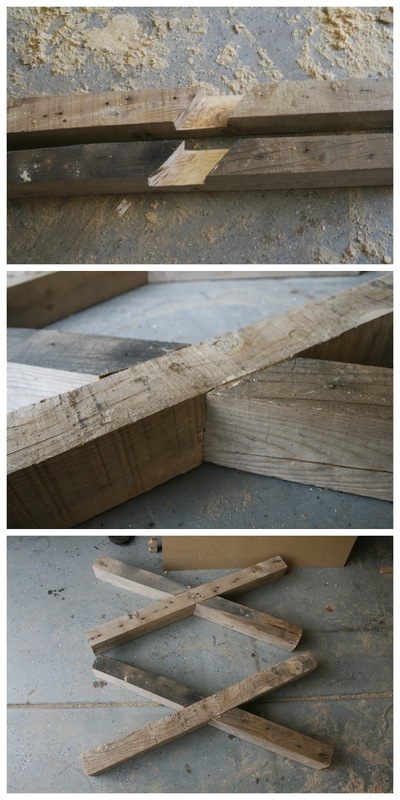 I was just a tad smaller than I wanted, so I simply attached some scrap wood to 3 sides, filling it out a bit. 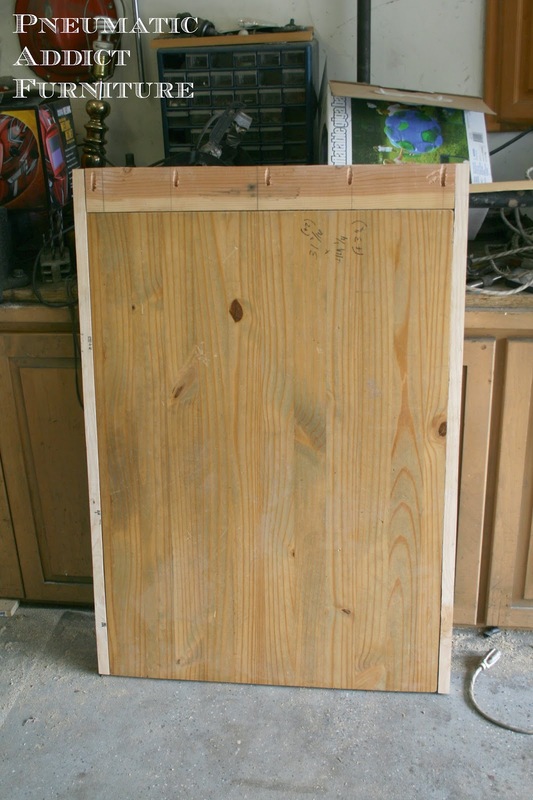 If you are using plywood, I would highly recommend adding a 1 x 2 frame to the outside perimeter. That will give the illusion of using really thick wood. Otherwise, your top will look awkwardly thin. For my metal, I hit up the remnant section of my local Industrial Metal Supply. 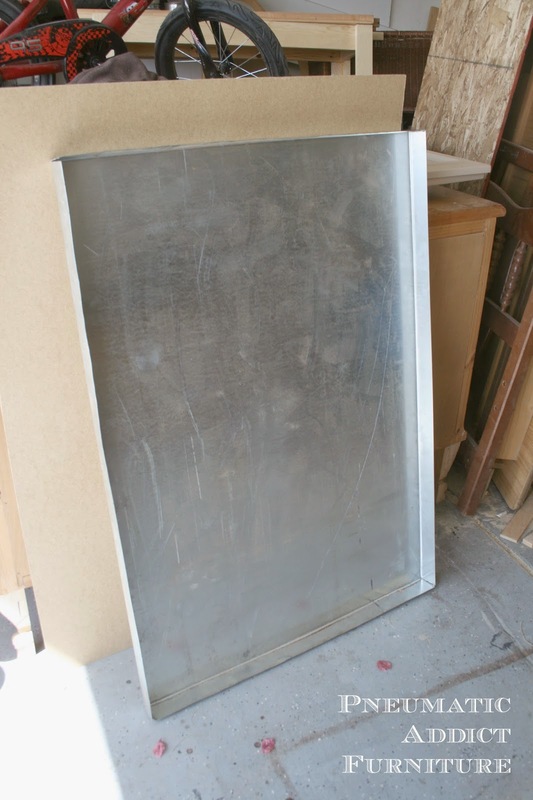 I found a piece of galvanized sheet metal, just the right size. Perfect! 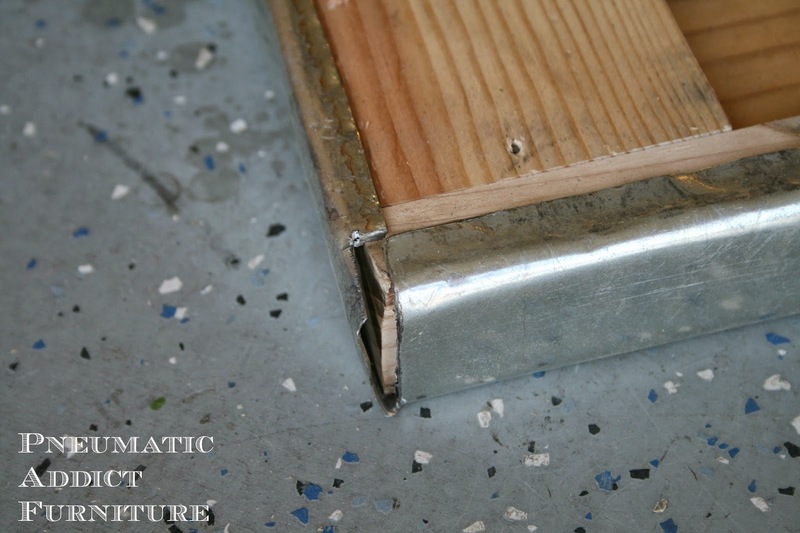 Something I didn't know until a few weeks ago, galvanized steel is actually steel coated with zinc. The zinc coating prevents rust, certain chemical reactions, and gets a cool patina on it as it oxidizes (think an old wash tub). Luckily, we have a friend who's family owns a welding business. A couple years ago, Bryce actually worked for them a few months while between jobs. They let us come to the shop and use their sheet metal break, bending the sides of my sheet metal down. I just had to notch out the corners with a angle grinder, and we could get nice sharp corners. If you don't have a cool welder friend like us, no worries. 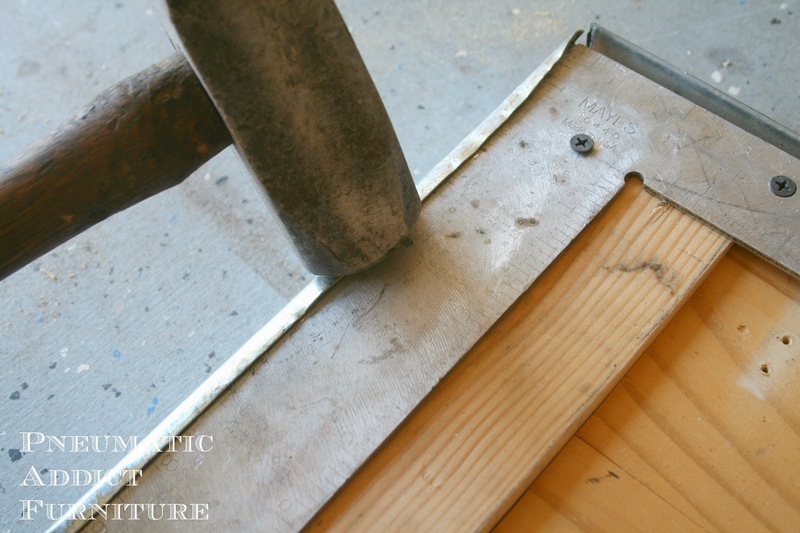 You could find a metal shop and have them do it for you for pretty cheap, or worst case scenario, you clamp a piece of angle iron to the edge and smack the hell out of it with a sledge hammer, bending it by hand. To attach the metal to the wood, I needed some sort of adhesive. I went to the hardware store and started reading the backs of cans. I found counter top contact cement, read the label, and discovered it works well "bonding metal to wood". I poured on a generous amount on to the underside of my metal, then used a large chip brush to smear it around evenly, making sure to get the sides too. I then slid my wood into the metal (I made sure to dry-fit the wood before applying the contact cement), and weighed it down while it dried. My wood was 1 1/2" thick. I bent the edges of my metal down 2". So, when the wood was glued in place, I was left with 1/2" metal overhang. This is a good thing. That way I had enough material to bend it down, creating a smooth edge of the underside of the table top. Since my table top was pine, a very soft wood, I decided I needed to reinforce the edges before I start smashing them with a hammer. 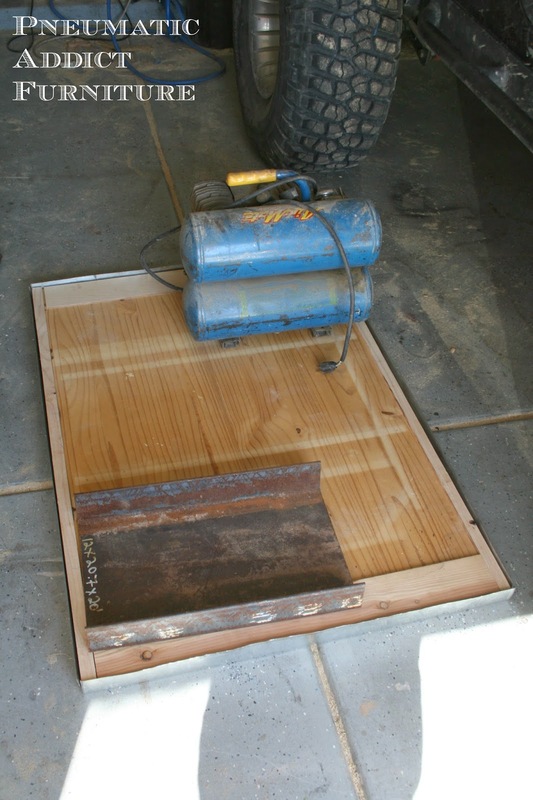 I would recommend this if you used plywood as well. Easy solution. 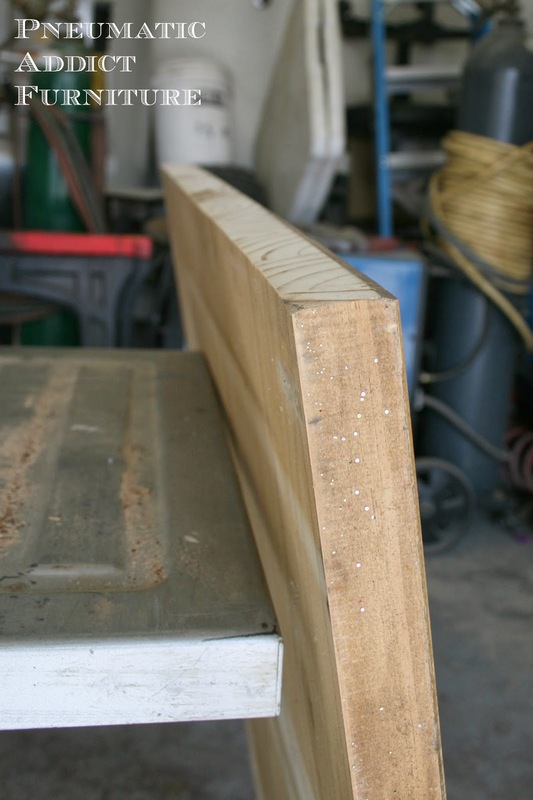 I simply drilled some holes in my framing square, lined it up with the edge of my wood, and screwed it down. Next, I went to town with the sledge hammer, bending the metal as flat and smooth as I could. Once I got that section bent over, I moved my framing square, screwed it down and continued to bend the edge down, until I made it all around the table. 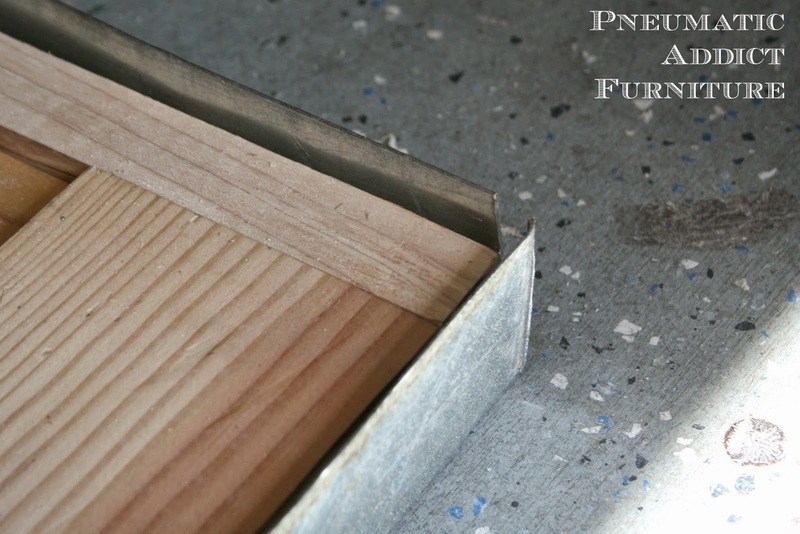 After removing the framing square, I pounded the metal flush and flat against the wood. For the corners, I used an angle grinder to notch out the corner of one side, so I could get a flat edge, once they were aligned. At this point, the wood was completely wrapped in metal. 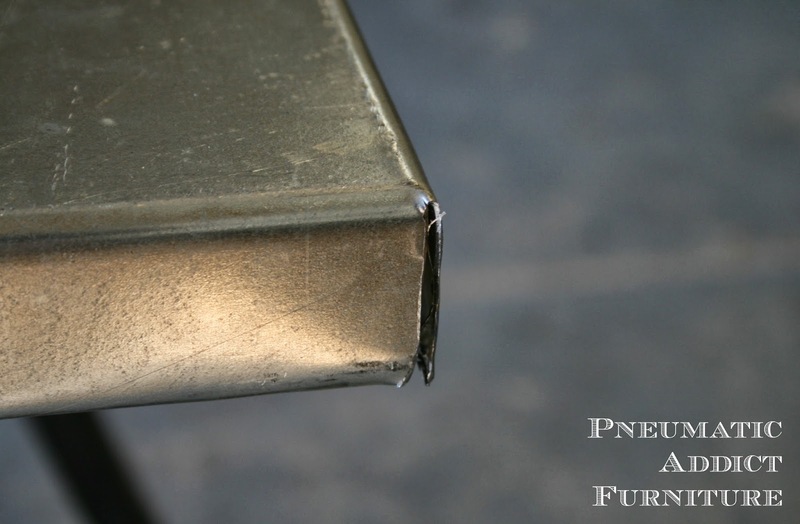 If you use sheet metal that's a little thinner, you may want to pound in some roofing nails along the bottom edge, and maybe in the outside corners, just so there is no flapping around. Once my corners were filled and ground smooth, the construction of the top was done. Time to address the table base. I had a pile of 4 x 4 posts, leftover from pulling pallets apart. There was a bit of old spray paint on them, but otherwise they were in perfect, weathered condition. To create the X design, you need to notch the posts, and fit them together. I wanted a wide and low X, so I decided on fitting them together at a 45 degree angle. To do that, I found the center of the post, lengthwise, and drew a line. Then, I used my speed square, lining it up with the center line and ascribing a diagonal line. I moved my square to the other side of the line and made another line. This gave me the area I needed to notch. 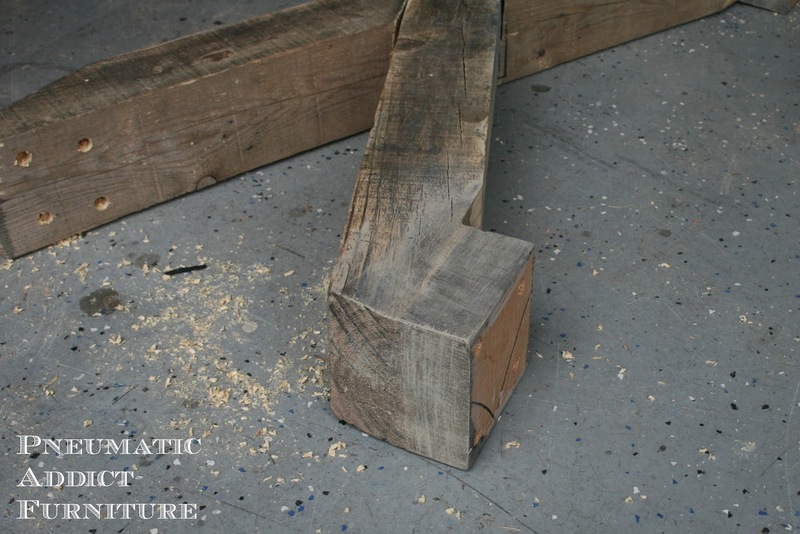 When notching wood to fit together, you want to cut through 1/2 the depth of the wood. These posts measured 3 1/2" deep, so I set my circular saw blade to 1 3/4". I first cut along the diagonal lines I had drawn. Next, I made several passes between the lines, making my cuts around 1/8" apart. At that point, I could knock out the thin wood between my cuts, using a hammer and chisel. 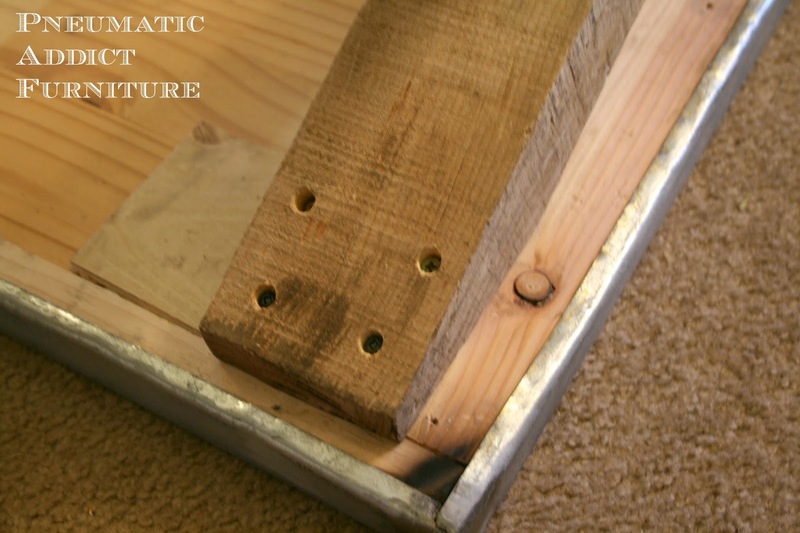 Once all my posts were notched, I spread a fair amount of wood glue in holes, fit 2 posts together, and secured them together with two, 3" wood screws. I now had 2, very heavy X's. To let the X's stand up straight, I needed to cut off the top and bottom corners. Since the angle where my posts met at 45 degrees, I needed a 22.5 degree cut to create a horizontal surface. 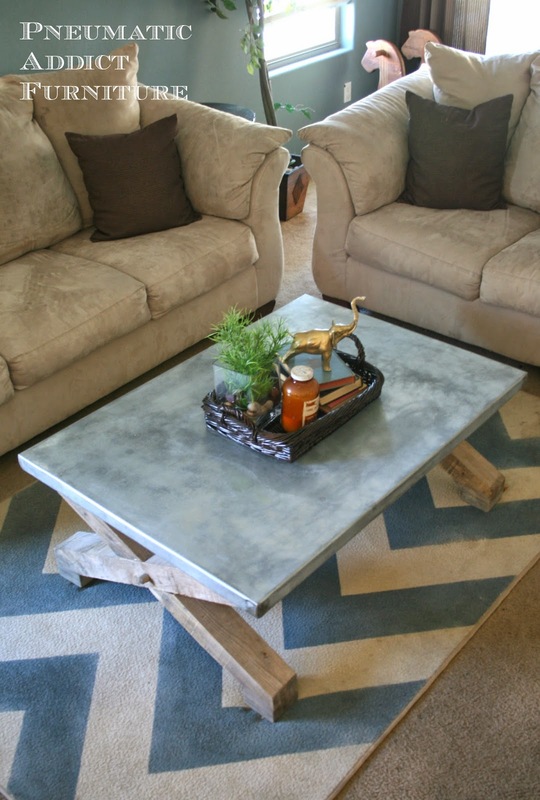 I wanted my table to sit a little higher, so I cut 4, 3 1/2" square blocks from a scrap board. I then attached them to the bottom of my X's with glue and screws. It kinda made feet for the X's. 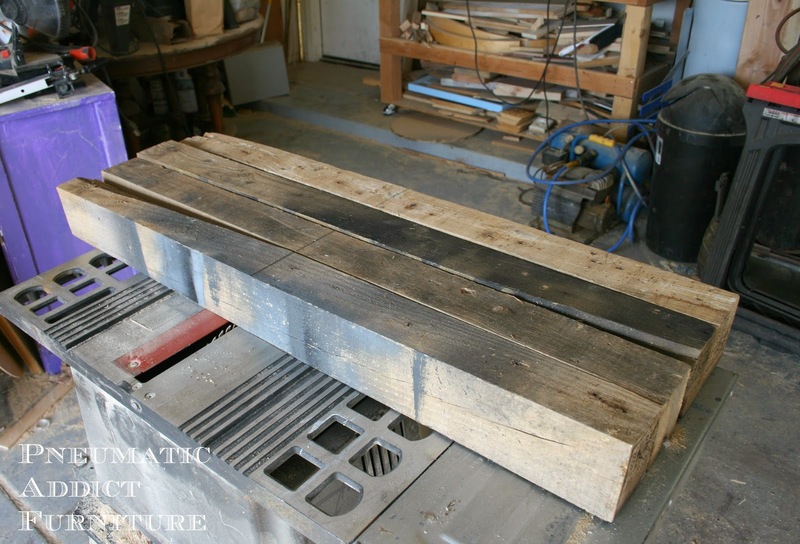 Since the blocks were cut from relatively new wood, I rubbed them down with my DIY oxidizing solution, and a little grey wash. The ended up matching the old stuff pretty well. I drilled and countersunk 4 holes on the underside of the top of the X's. It was then time to mount the X's to the table top. That part was easy, I flipped the top over, and ran four, 3" screws through the holes and into the top. Done. Whew... That was a lot. Sorry for the longest tutorial ever. Who's ready for some "after" shots? I need more of this aged zinc look in my life. I went through a process to get the patina just right, but unfortunately took terrible photos. VanHook & Co follows a process similar to mine, so if you're curious how to get an aged patina on zinc, you can find a good tutorial here. I love the rustic, hand-hewn look of the X's. To make them look a little more authentic, I glued on some small, square dowels to look like the posts were mortised together. What do you think? Do you like my current metal fixation? If you love it, this table is for sale under the 'shop' tab. I love your tutorials because they're so complete! ! Great job again, Alisha. I really like the metal with the wood, but had no idea how to do anything with metal. You make it look easy, something I will have to try someday. What. That looks so easy. Pinning this! Thank you for sharing on Chic By You. I love those chunky legs! What a stunning table! Why are you so cool? This is so awesome! I of course love the top, and the legs are simply perfect! WOW!!! And I mean WOW!!! Oooh la la! I saw this in your shop the other day and just LOVED it! you did an amazing job! Oh how cool! I love the mix of wood and metal! Such a cool design! This would look awesome in my house. 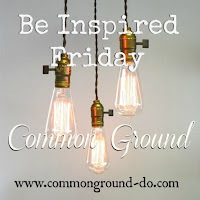 This is such an amazing DIY - really really gorgeous! 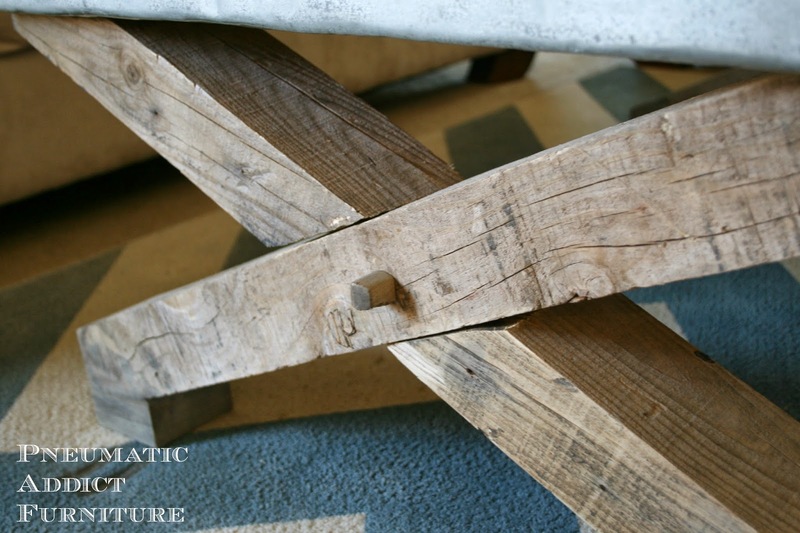 Love the industrial mixed with the wood - I prefer yours to the original! You are da bomb!! I can't believe you created this. Well I can, but wow! What a great tutorial, featuring at my party today. You need to think about getting a book underway with all your completely out of the box makeovers. Way to go! This is the most unbelievable coffee table ever!!! I absolutely love every aspect of it and would love to have a piece like this in my home. Thanks so much for sharing!! This is awesome! I found you through your other coffee table build which I love, but I just might love this one even more. So impressed with your welding - would love to learn to weld myself. This is awesome! Might have to try it out :) Thank you for the inspiration. what happened with the dado? Saw run-out? There's a big gap at the crossing. But it is rustic looking and I like it. 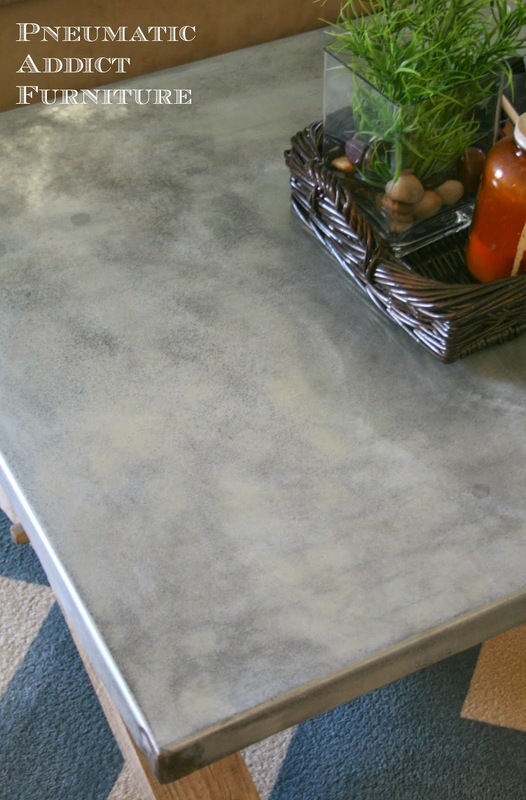 We installed zinc countertops in our kitchen & bought the zinc sheeting, solder & top coat from Rotometals online. The entire kitchen cost us about $200 for all the materials. The folks at Rotometals could not have been nicer, more helpful or more patient. They also have super-helpful how-to videos on their site & on YouTube. 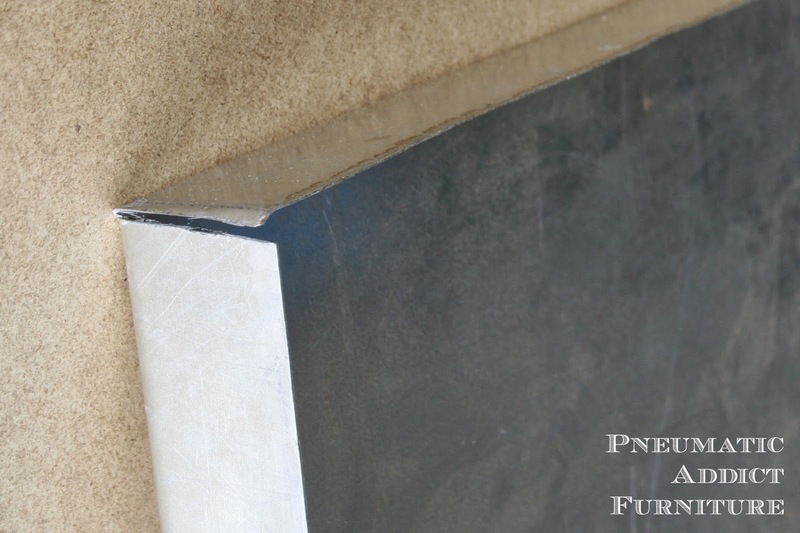 The zinc comes in a few thicknesses for different applications, and was REALLY easy to work with & install ourselves. 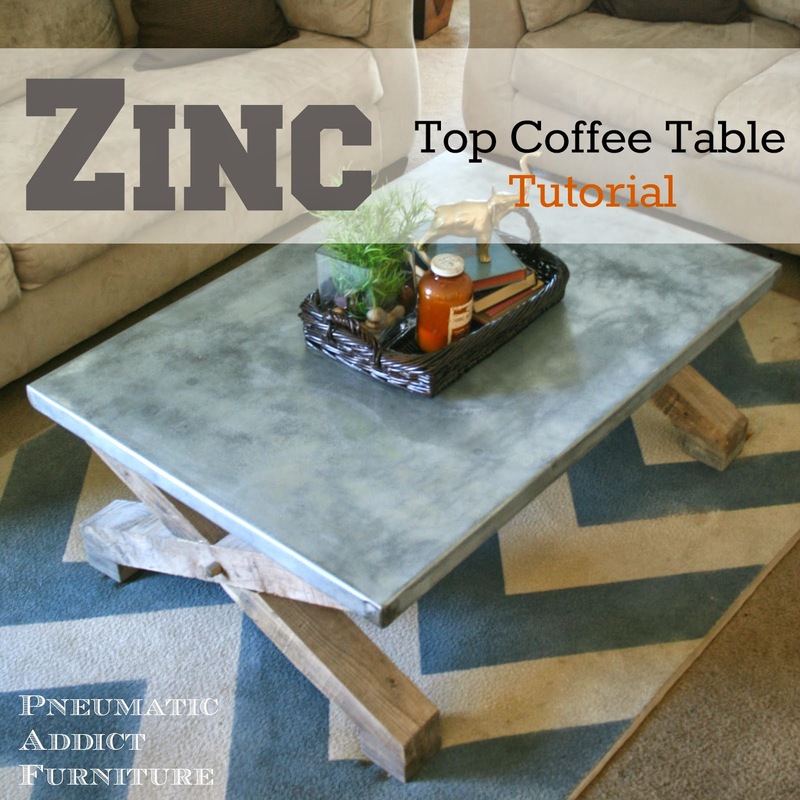 I would really recommend using real zinc as opposed to sheet metal because the patina can't be duplicated and it's easier to bend & adhere to surfaces. This is SO cool. I love that you are expanding your skill set. You are totally inspiring! 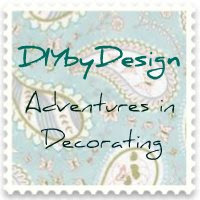 I am a retailer for the Amy Howard at Home paint and accessory line. 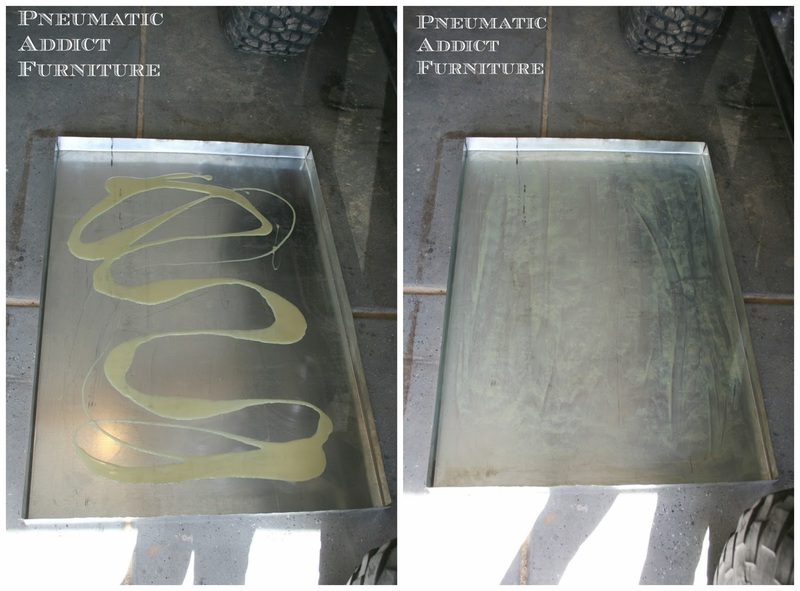 She has a zinc solution that will darken sheet metal to make it look aged and beautiful. That's simple, compared to the wonderful job you did creating this professional looking table. Well done! Fantastic work! I love the look of that top. I would also love to link to this in an upcoming Daily DIY if you didn't mind! Hi! Lovely table! 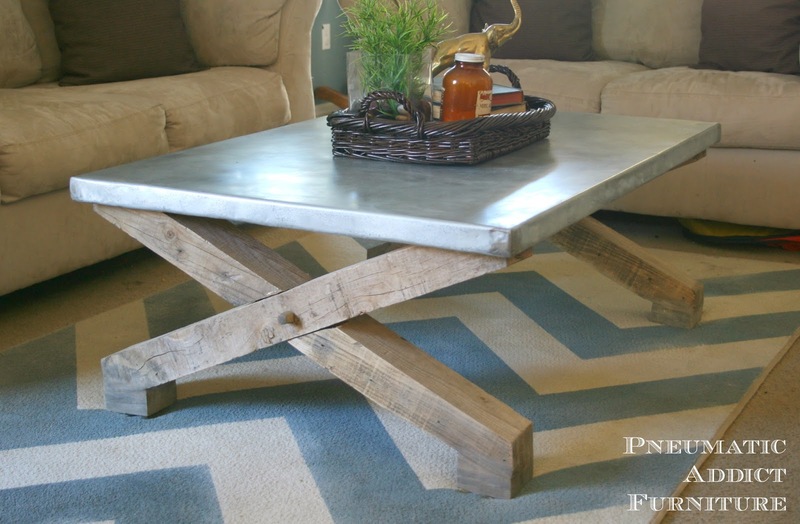 I'm looking to do something similar for a dining table. My husband is worried that if the sheet metal is thin enough to pound it flush with the wood... that it will be thin enough for there to be dents made in the top. How has the table held up? Is his concern valid? Thank you! Fortunately, galvanized steel is pretty tough. The piece that I used is actually much thicker than needed, and extremely durable. If you use a thinner sheet, you may have some small dings, but I doubt it. I bet it holds up better than he might expect. 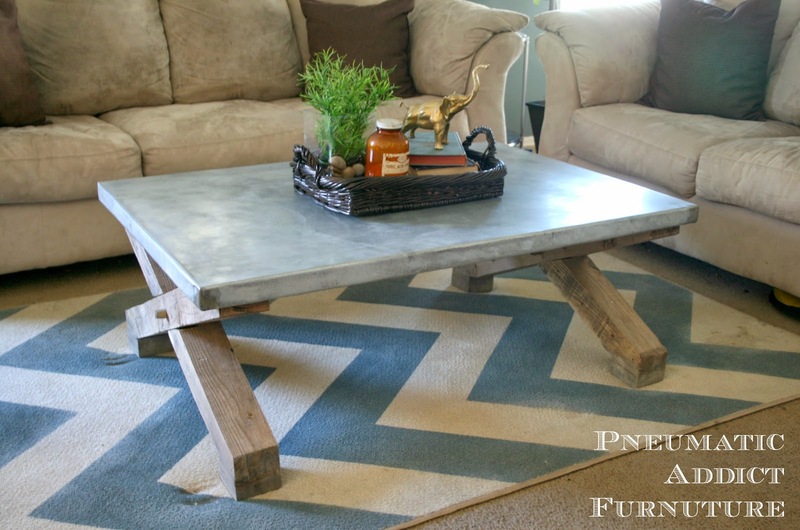 Love, love, love this table what was the finished size ..I would like to make one for outside to sit in front of a all weather sectional. Thank you! I sold the table, and I don't remember the exact dimensions. I think it was around 30" x 48" x 18"